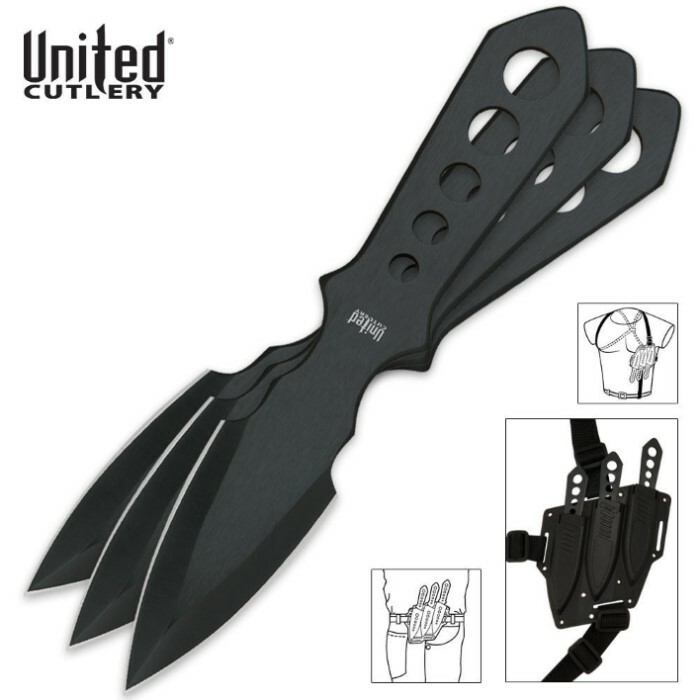 This throwing knife set is tactical, easily concealable, and hard hitting. 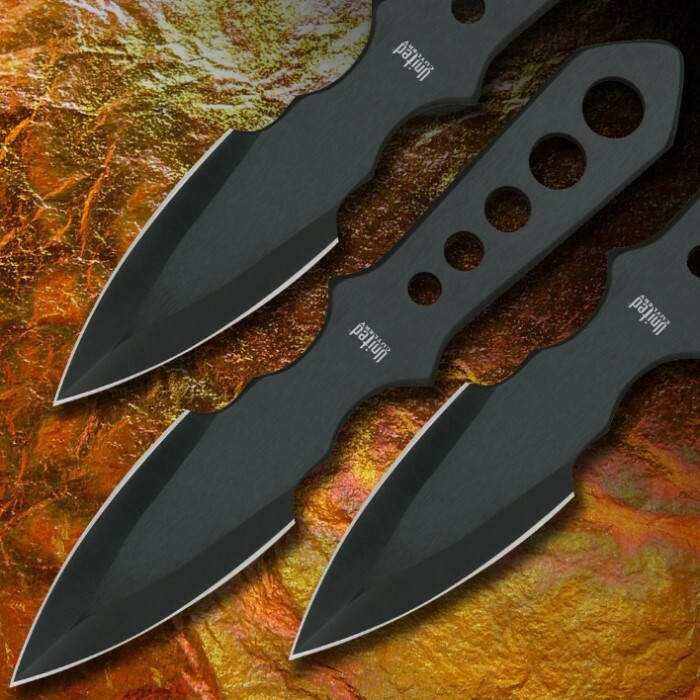 Each of the three throwing knives is black-coated and balanced for accurate throwing. The stainless steel blades are double-edged. Includes a hard ABS sheath that each knife locks into. The sheath can be worn on a belt or concealed using the included nylon shoulder harness. Each knife has a 2 in. blade and measures 5 1/2 in. overall. I love the sheath! It form fits to my side via the shoulder harness or my thigh via belt wear. The knives fit snug into the sheath and will not come out until pulled. I've had a few different types of throwing knives over the years and these are by far the best I've ever had! Highly recommend! My first reaction was that the knives seemed small. But, it is clearly noted that they are 5 1/2". I am a novice thrower. It took a few hours of throwing before I could get about a 75% rate of engagement into the cardboard box I was throwing at. Also, I was able to get a grouping off about 1 1/2' of my target (pinned a playing card in the center of the box) after just a couple hours. I have yet to damage these knives in any way. Granted, I am throwing them at a Styrofoam block filled TV box and not hard wood. I bought a set of larger/heavier throwers and like them much better and am much more accurate with the larger ones. The sheath is extremely well engineered. It is slightly contoured to wrap around your hip or under your armpit, if you choose to wear it using a shoulder holster method. The shoulder holster option didn't work well for me, but I have a large torso. It may fit a smaller person better. The knives stay in the sheath and virtually cannot be shaken loose to fall out. They sheath feels good on the hip using the straps as a belt instead of the shoulder holster option. If I really wanted to, I could buy some webbing or leather straps and beef up the shoulder holster to work better for me. But, I don't plan on ever using these as a method self defense. They are much too light for that at my skill level. The knives came pretty sharp and I got this with my friend we immediately started throwing these at a wooden plank when we threw them right they stuck in like the wooden board was cardboard. Great set and the case is awesome as well we decided to have it on our legs and they fit perfectly. The only knives with a real sheath. Although there not very large, there still cool. If only the exPendables knives had a kydex sheath aswell. . These knives are well balances and well made in my estimation. Worth the price for sure. got these knives not knowing how to throw them at all. after a couple hours of practice I was hitting almost every time. took some paracord and threaded it through the holes for more of a grip. the sheath is good tough plastic and I actually just use the shoulder straps without the belt clip and it works just fine. ive even sharpened them on a whetstone and everything. I love these knives and ive found a new hobby. great purchase! Awesome, thought they were bigger. But that's not a real problem considering I'm throwing them at a dart board. Very cool and the shoulder rig is awesome too. Highly recommend as they come sharp and are very well built. Great buy good blades with good balance and case is nice however straps are kinda cheap. I do a lot of fishing so I wanted them to use as snake knives and they work great. 10 to 15 feet away they are dead on. And the sheath is great. I am very happy with this set.